Oh wow so much to do prepare for Open Studios here in Vancouver, WA! Meanwhile Lymes started inflaming my joints again–most especially my shoulders and neck. 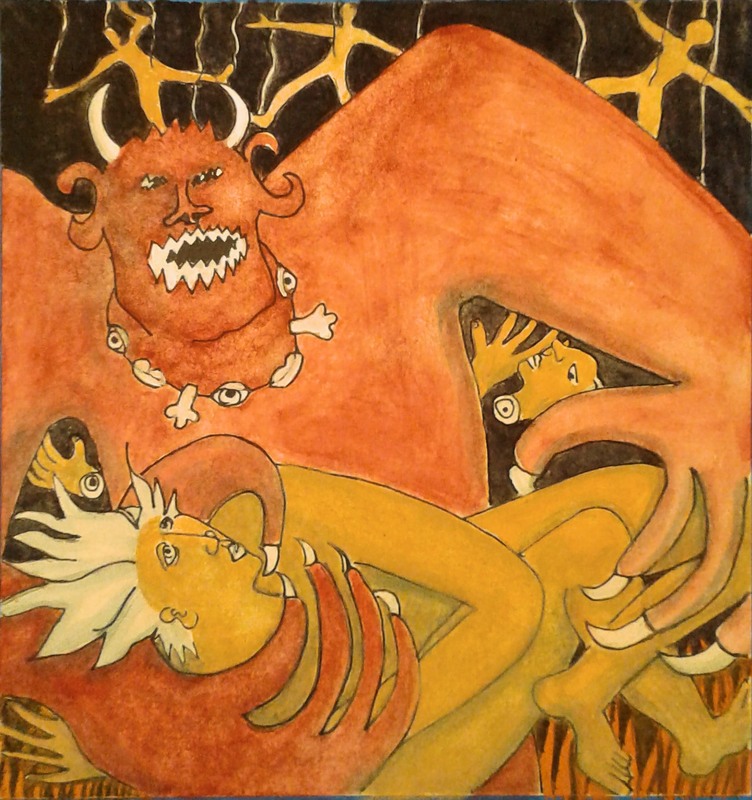 I have to just focus and do what I have to do to take care of myself and let the rest slide for now–though I did manage to take one of my paintings over for the big show for the Clark County Open Studios at the beautiful new Cave Gallery here in Vancouver, WA (reception this Friday!!). Am finally starting to feel better using natural remedies!! Likely tomorrow I will be able to draw and paint again–perhaps by doing a larger (better) version of this small sketch to the right (“Rubbing Her Back”) which relates to husband rubbing my sore shoulders. This afternoon I went for a walk with him. Doesn’t sound like much but for me it is a victory! Given where I was at the last few days. So yes often my art is born from struggle even if it does not always show it directly. I often like to focus on communication, beauty, eros and transformation. In this case it is more directly about the transformative power (and closeness) of healing. 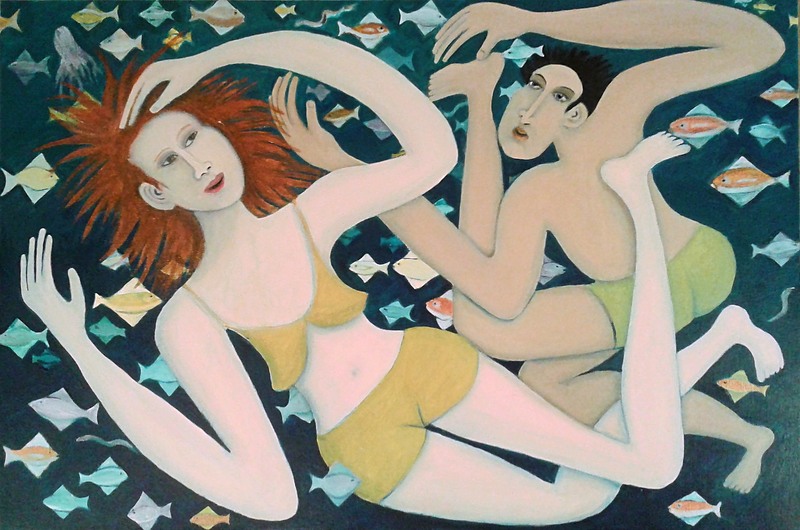 Am nearly finished with this piece “Swimming Underwater.” Its been good to make a work that expresses the joy of life in these troubled times. What else can I say about it? Except that I feel its so very important not to lose sight of what is is that makes us happy. For me I am reminded of swimming down in Mexico years ago off of Guaymas. I was so impressed/amazed by the quantity of colorful fish! That and of course my continual exploration of the dance between the sexes and the fineries of body language and subtle facial expressions. From it I am inspired to do another more mythic piece of giving birth to a new world, perhaps also from underwater. Will see what and if it happens… Be watching for it. It all depends on what my psyche is ready for!! Though for now I may want to simply finish some pieces for the Clark County Open Studios happening here in Vancouver, WA this November 11th and 12, 2017. Be watching for that too! 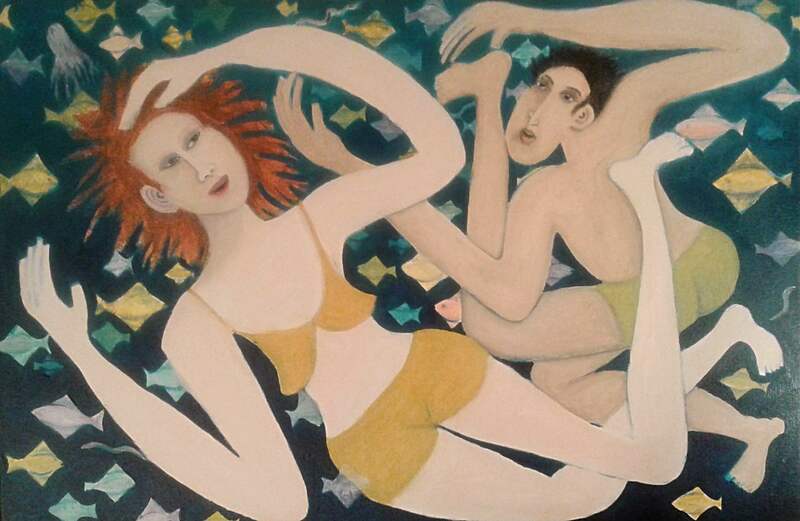 I just started working on my painting Swimmers again in preparation for the Clark County Open Studios in mid November. Given this very traumatic fall season with massive forest fires, hurricanes, earthquakes and yet another mass shooting, I feel its important to realize we all have special moments that make this world very worth preserving. Meanwhile we need to do what we can to help those in need and begin to rectify some of the causes of these difficulties such as global warming and creating a better socio-economic system while still remembering to cultivate and savor those happier moments.